…and the line between infomercial and satire grows fainter still. They should combine the Hawaii Chair with the Ballbike. 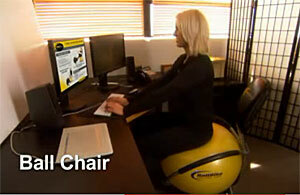 The Ball would move in a circular motion like the Hawaii chair and you can pedal at the same time! It’s a million dollar idea! It “makes ordinary excercises obsolete” because if you would use this you’d be to straight-jacketed to excercise. I got one for my mother. I’m under no illusion that this is some miracle machine for weight loss, but that’s not what I got it for. My mother had some recent medical issues and it’s left her weak and unbalanced. The doctor said she needs to get some exercise to combat muscle atrophy and build up her heart activity. Because she is weak & unbalanced, using a treadmill is not an option. Neither is yoga, tai chi, or many other activities that have you primarily standing or bending. Also, because of other medical issues, sitting on the hard seat of a conventional bike machine is out of the question. So enter the ball bike. As long as she gets her legs moving and her heart pumping, it is doing the job for which I paid a lot of money for…and it is worth every penny. She even likes to just sit on it, as it relieves the pressure put on her by normal chairs. To conclude, do I think this will help people lose weight? Do I think it will improve someone’s core muscles? I don’t know and I don’t really care. But do I think it’ll improve my mom’s health for the better? Your damn skippy I think it will! My friend bought one of these and had some issues with the bars but the company fixed it and he has lost over 25lbs. I think he rides it everyday. He loves it and I’m thinking of buying one myself! I have a steel plate in my leg and this may be good for me.